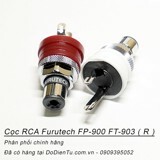 Furutech makes a wide variety of OEM parts known the world over for their quality construction and superb sound. Our engineers examine every part of the signal and power path no matter how small and optimize each and every connection. Furutech’s beautifully finished, beautiful sounding RCA sockets are the result of meticulous engineering and careful audition of various suitable materials. The FT-903 features an α (Alpha) pure copper conductor for minimal impedance and a super heat resistant Liquid Crystal Polymer Resin housing. The superior compound damping material (LCP) is also incorporated into the chassis nut to ensure there is no resonance. The construction of the FT-903 is patent pending and its design is unique to Furutech! • Dimensions: 16.0φx 40.0 mm (L) overall length approx.